Skill(s): Photographic memory, agile, artistic, deducting, and always with multiple tricks up his sleeve (both figuratively & literally speaking). Personality: Michevious, mysterious, quriky and unpredictable. At fist he may act and appear like a calm, collected and well-mannerd young boy, when he in turth can be just as crazy and charismatic like Clopin, being raised by the guy obviously had some effect on him. He's quite the talented actor, and has on several occastions used that to his own advantage and amusment. He's highly intelligent, but like his guradian has been stamped as mad by most, seeing as he thinks and sees the world in a much different way than the rest. He's inventive and crafty, and holds a big scray curisoity when something or someone manages to catch his interest. The word 'shame' does't excist in his dictoranry. Notable Attributes: His green eyes and small, fragile looking form, been mistaken for being younger than he acutally is. 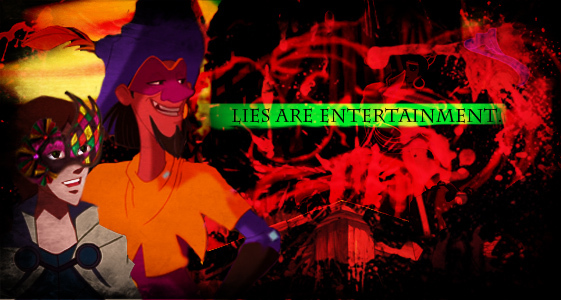 Aside for being well know on the road with the gypsy troupe along with Clopin, trouble always follows wherever he goes. History(if any): When still an infant, Loki was found abandoned somewhere along the road by the well-known and infamous Clopin Trouillefou. So, growing up along with the troupe and raised by what none would call a 'sane' man, it was of no big surprise how Loki turned out to be, crazy like his father figure, both in his own way yet with many similarities as him. Who his parents was never concdernd Loki, as he was quite happy with the life he had anyway, free to do whatever he pleased (according to him and Clo) whenever he felt like it.